Description: 3m 21.5mm Overflow Pipe White A 21.5mm solvent weld overflow system in white PVC-U. No expansion gap required on the solvent weld overflow system. Apply solvent cement evenly to both surfaces of joint. insert pipe fully in the socket depth and remove surplus cement with a cloth. A.. Description: A 21.5mm Overflow 135 Degree Bend in white PVC-U. No expansion gap required on the solvent weld overflow system. Apply solvent cement evenly to both surfaces of joint. insert pipe fully in the socket depth and remove surplus cement with a cloth. Allow five minutes to set before .. Description: A 21.5mm Overflow 90 Degree Bend in white PVC-U. No expansion gap required on the solvent weld overflow system. Apply solvent cement evenly to both surfaces of joint. insert pipe fully in the socket depth and remove surplus cement with a cloth. Allow five minutes to set before handli.. 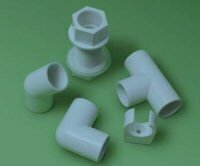 Description: A 21.5mm Overflow Straight Coupling in white PVC-U. No expansion gap required on the solvent weld overflow system. Apply solvent cement evenly to both surfaces of joint. insert pipe fully in the socket depth and remove surplus cement with a cloth. Allow five minutes to set before han.. Description: A 21.5mm Overflow Tee in white PVC-U. No expansion gap required on the solvent weld overflow system. Apply solvent cement evenly to both surfaces of joint. insert pipe fully in the socket depth and remove surplus cement with a cloth. Allow five minutes to set before handling and twel.. Description: A 21.5mm Overflow Pipe Clip white PVC-U. Dimensions: 21.5mm .. Description: 21.5mm Overflow Tank Connector Straight Dimensions: 21.5mm .. Description: 21.5mm Overflow Tank Connector 90 Degree White Dimensions: 21.5mm ..